Friday, October 9, 2009. An Open Letter, signed by Hungarian and European human rights and disability organisations, was today sent to Hungary's Prime Minister Gordon Bajnai and the Minister of Social Affairs László Herczog. The letter protests against the Hungarian Government's proposals - Measures 3.4.1 and 3.4.2 of the Social Infrastructure Operational Programme - that will permit the building and refurbishment of institutions for people with intellectual disabilities and mental health problems using EU Structural Funds. On September 26th -28th 2008 for the fourth time the “Kremnica´s Crutch“ – the Slovak wide competition of people with physical disability in singing, reciting of poetry and prose - will take place in the premises of Toliar of this Middle Slovakia town. The FIMITIC member association HSUIR (Croatian Association of Societies of Disabled Workers), Croatia, in the year 2007 was celebrating 40 years of its existence, looking at a significant review period of hard work and tremendous achievements to support disabled people in Croatia in the various fields of their major concern in daily life. It was a time of many commendable common actions on national and international level. The FIMITIC member association in Portugal, the National Association of Disabled by Work Accident - ANDST -, based in Porto, at its recent Assembly presented its new Action programme and elected a new Board of Directors. Luís Machado was elected new President of ANDST. Read the new ANDST Action programme. 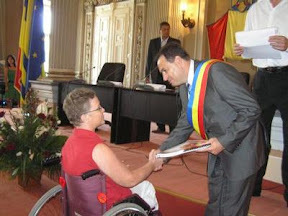 The member association in Slovakia, the Slovak Union of Physically Disabled - SZTP - does attach great importance to the issue of Universal design and accessibility and thus monitoring and lobbying the concept on environment friendly policy.A good example is shown by the submitted contribution on tourist facilities entitled “Some new trends in the social tourism in Slovak Republic”. Further facilities of self-government, health and education are initiated as well. The competition Woman of the Year, organized by â€žAvantajeâ€ magazine and Avon, nominated the winners of its ninth edition. This year a popularity award based on the votes of the readers of the â€œAvantajeâ€ magazine and other six awards of excellency in different domains. For the popularity award the competition gathered seven nominees in the domain of audio-visual, personalities actively involved in charitable actions as well as in the promotion of culture and of authentic values.